To review this title, I checked the book out of my local public library. Me: Aiden, what do you want to be when you grow up? Aiden: I want to study volcanoes and watch them blow up and spit out all that hot lava and see the mud slide down the side of the mountain. That would be so cool! ME: Oh, you mean you want to be a volcanologist. Aiden: Yea! That's what I said, a vulcanologist. there are 1,500 potentially active volcanoes that dot the globe. More than one billion people -- 20 percent of the world’s population -- live in volcano hazard zones where they could loose their homes or their lives. In Eruption, another first-rate title in the Scientists in the Field series, Rusch traces the development of the Volcano Disaster Assistance Program (VDAP), a brave team of scientists whose mission is to prevent international volcanoes from becoming disasters. VDAP is a partnership between the U.S. Agency for International Development's Office of Foreign Disaster Assistance and the U.S. Geological Survey. VDAP came together in 1985 after the horrific eruption of Nevada del Ruiz located in Columbia, South America where more than 23,000 people were killed. The VDAP calls home the Cascades Volcano Observatory in Vancouver, Washington where they develop tools and techniques using the effects of the 1980 blast on Mount St. Helens. The book explains the work of the VDAP by explaining their efforts at Mount Pinatubo, Philippines in 1991, and the November 5, 2010, eruption of Merapi, Indonesia. Did you know the VDAP holds a Volcano Training Camp? Because the VDAP is a small team, they can’t be everywhere when needed. The camp allows those volcanologists in other countries to learn from VDAP experience, the best equipment to have, and overall, how to help them do their jobs better to save more lives. The book’s design includes sidebars with interesting information (“Don’t forget the toilet paper...what scientists take with them out in the field”), breath-taking photos, and a highly readable text that will immediately pull readers in and keep them turning the pages. Back matter includes glossary, further reading, author’s note, and index. To enhance the experience, if using in a classroom, visit the VDAP website or visit the US Geological Survey’s Volcano Hazard page and subscribe to the Volcano Notification Service (VNS). Visit Rusch's website and read our past review of another example of quality nonfiction in the Scientists in the Field series, The Mighty Mars Rover, or visit I.N.K. Interesting Nonfiction for Kids blog to read Rusch's post, On How Research Can Make You Throw-Up. 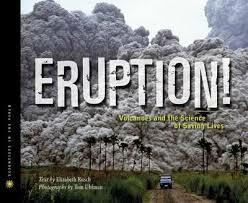 Eruption would be a great book to hand to those readers who are devouring the graphic novel, Into the Volcano by Don Wood. Uhlman's photographs are amazing. This one sounds fascinating, and based on how well done the other Scientists in the Field books are, this looks like one to add to the collection for sure. This book really grabs you at page one. Sounds awesome. My kids want to see a live volcano when we go to Hawaii in a few years. I'll be sure to have them read this book first!